Ajay Pankhania is an Interventional Radiologist with a keen interest in vascular radiology and embolisation techniques. He qualified from Manchester Medical School in 1996 and completed basic surgical training before embarking upon a career in radiology. After a 2 year subspecialist programme of training in interventional radiology in Manchester he came back to the South East, where he grew up. He has been a practising Consultant Interventional Radiologist since 2007 and has been working in Surrey since 2010. 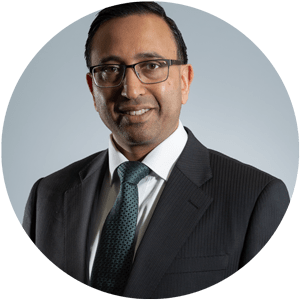 Ajay believes passionately that The Whiteley Protocol® offers the best treatment options for his varicose vein patients. A keen skier and golfer, Ajay has 2 young boys who keep him very grounded!